Situated in prestigious Highland Park within the Bradfield School District, this fabulous traditional residence is nestled on a wonderful 80’ x 167’ lot with an abundance of mature trees and great drive-up appeal. In keeping with the timeless charm of the original home but beautifully updated, details include spacious entertaining areas, gleaming hardwood floors, deep molding, recessed and decorative lighting and fabulous granite and marble finishes throughout. 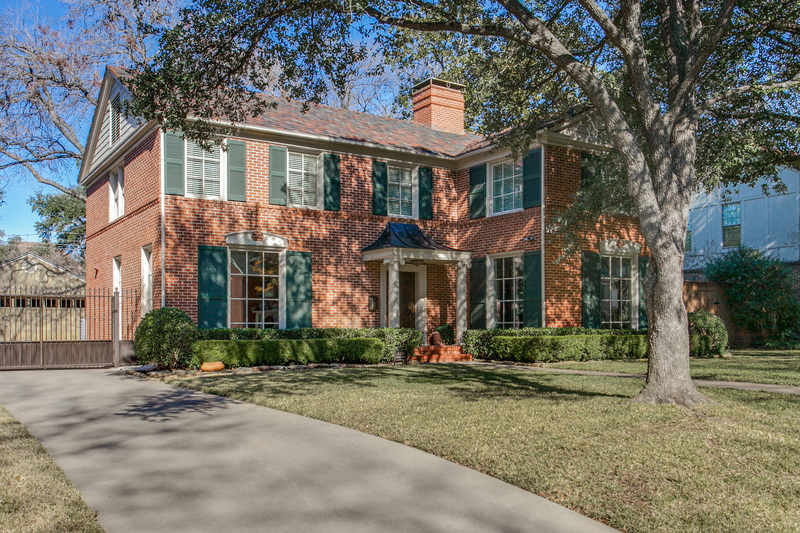 With its brick exterior and tile roof, the elegant two-story home offers approximately 2,960 square feet, three bedrooms, 2.1 baths, two entertaining areas, two dining areas, two fireplaces, and huge beautifully landscaped backyard grounds boasting a fountain, storage shed, two-car detached garage with guest quarters, and an automatic gate. Enter through a wood door to an inviting center entrance hall, which gleans with sophisticated dentil molding, gleaming hardwood floors, painted paneled walls and a stairway, with wood balusters, leading upstairs to the second level. The front foyer is flanked by the formal rooms and also leads to the rear of the home, where handsome hardwoods continue. Both with dentil molding and floor-to-ceiling windows providing scenic views of the front landscaped grounds, the formal rooms are oversized with elegant proportions. The living room is centered by a marble-surrounded fireplace with a wood carved mantle, and the dining room is graced by a fabulous brass chandelier, stylish wall coverings and also conveniently leads to the kitchen. Showcasing premier stainless, white and paneled appliances, including Bosch, Viking, Thermador, GE Profile, and KitchenAid, the oversized granite kitchen boasts light-filled windows with natural blinds, abundant storage space, and a large breakfast area, which is illuminated by an iron-and-glass pendant light and also features built-ins, with glass front top cabinets, a granite-topped table and love-seating. Adjacent, a mud nook area opens to the backyard grounds. Perfect for relaxation and entertaining guests, a nearby spacious den is framed by a brick-surrounded fireplace, with a wood carved mantle, and gleaming hardwoods floor the room. Two walls of floor-to-ceiling windows, including bay windows, provide an abundance of light, and a sliding glass door also opens to the outdoors. An elegant powder room, appointed with a marble pedestal sink and black-and-white marble patterned floors, serves the entertaining areas, and a coat closet rounds out the first floor. Speakers for selected sound are also located in the living room and den. Second level of living is equally impressive. Ascending the stairway, first stop is a large landing or sitting area, and a huge walk-in closet provides abundant storage space. The landing also leads to the master suite and to the additional two bedrooms. The generous-sized master suite showcases gleaming hardwood floors, window blinds, a large walk-in closet and a fabulous marble and travertine bath with a pedestal sink and a separate double shower. The two additional bedrooms range in size and style, one with a large sitting area and elegant drapery, but both with handsome hardwoods, window blinds, large closets and are served by an elegant granite and ceramic tiled bath. Fully equipped, a utility room houses built-ins, black-and-white ceramic tile floors and also provides room for a full-size stackable washer and dryer. Outside, the fabulous backyard grounds set the tone for a relaxed atmosphere for entertaining. The huge beautifully landscaped backyard showcases gorgeous mature trees, a fountain, storage shed, and a detached two-car garage, with abundant built-ins and guest quarters. Featuring stained concrete flooring, the guest quarters feature a large living area, elegant granite and ceramic tiled bath, and a large storage room, including built-ins with a sink area. An automatic gate completes this fabulous residence.